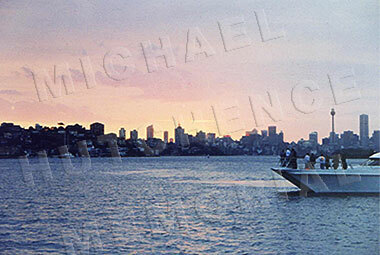 On January 22nd, 1998, Pastor Dennis Patterson, conducted a sunset memorial service aboard a charted vessel, to scatter Michael’s ashes on Sydney Harbour. Immediate family members, the band and closest friends who attended will probably never forget that most spiritual and private hour. Around 8:00 p.m. that evening, Sydney’s skies were in all their glory. 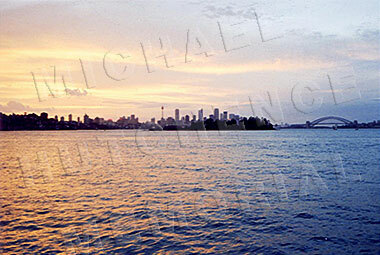 Ethereal hues splashed out over a pastel sky that silhouetted the Harbour Bridge, the Opera House and the city skyline. They called it Michael’s sunset. The series of events that had led to this sorrowful gathering were barely sinking in. Emotions were still vacillating from, shock, grief, bewilderment, numbness. Yet in hindsight, it seems the moving of sovereign grace was already at work, orchestrating a series of almost incredible circumstances that culminated in what felt like a covering cloud of compassion over the “The Ambience” vessel on that warm, calm summer evening. After Michael’s death Kell and Susie went to Bali in early December to seek some peace and spiritual solace. On their return Kell continued to wade his way through a sea of letters that had arrived since Michael’s death. The loving response of INXS fans and the public was overwhelming. One letter that had particularly taken his attention, was from a minister, the Reverend Dennis Patterson. Kell received a telephone call from the Pastor the day before the funeral. Kell had expressed to him how comforting his words were and so Kell requested that he fax them through to him. “It’s only by God’s grace that we had Michael at all. Thank God for the privilege of having Michael as a son for these past 37 years”, the Pastor had said. Pastor Dennis Patterson had been a rock musician during the 70’s and 80’s and so understood some of the pressures placed on oneself and family. Just two weeks before Michael’s death, Pastor Patterson had lost a colleague and friend, a fellow minister who had booked into a hotel and there taken his life. His friend had been prescribed Prozac for deep depression. So Pastor Patterson had felt strongly about writing to Kell, believing that the comfort God was giving him was to be passed around. He had also known a lot about Michael and INXS. In fact he had been a high school music teacher and had taught music to at least two international rock stars who knew Michael. He wrote to Kell saying he had followed INXS’ career with interest having appreciated their “legend status” from when he was a supervisor of trainee music teachers at Killarney Heights High, where Mike and Andrew first met. Kell decided to give the Pastor a call and they subsequently set up a meeting. Perhaps it was “meant to be”, as had not the Pastor been recovering from a dirt bike accident he would have been away on family holidays and might never have received Kell’s call. When they did meet a few days later they discussed Michael, about his boyhood days, when he and Rhett would have Kell drive them to a paddock not far from the Pastor’s office to ride their dirt bikes. There was some mutual comforting and before Kell left he asked Dennis to do conduct Michael’s ashes ceremony. Though he had previously asked the Dean of St Andrew’s, he was now feeling that he wanted Dennis to do it. When Kell learned that the Dean would be on holidays and thus unavailable, he again approached Pastor Dennis Patterson who now readily accepted. Over the coming weeks Kell and the Pastor talked frequently as they planned the ceremony. The question of the ashes became a very vexed subject but in the end it was agreed by all parties that to overcome any arguments the ashes would be divided into three each placed in wooden urns and one each given to Kell and Rhett, his mother Patricia and sister Tina, and another to Paula. Kell was able at this time to bring strength to everyone. He showed such courage in the patriarchal role, bringing together as best he could the family, the guys in the band, the management and road crew, and Michael’s close friends, including Jimmy Barnes, Michelle Bennett and Jenny Morris. During the days leading up to the 22nd January, the Pastor planned the ceremony while Kell organised the hiring of the vessel “Ambience” and continued to contact Mike’s closest friends. Pastor Dennis had suggested that they invite his friend Erana Clarke to sing “Amazing Grace” after the scattering of Mike’s ashes. Erana was a Sydney session singer who according to Dennis, “Sings from the heart as well as the throat. She loves to sing Gospel songs since her conversion to Christianity had broken her drug addiction.” While Kell was a little reticent, he trusted the Pastor’s better judgement, after all, others like Jenny Morris could sing too if they had the emotional strength. Erana was overseas on tour and didn’t contact Dennis until she arrived back in Australia, the day before the ceremony. It was only then that the Pastor and Kell truly appreciated the significance of Erana Clarke singing at Mike’s ceremony. Erana had called to say that she was honoured to sing at Mike’s ceremony. What both Kell and Dennis hadn’t realized until they spoke with Erana on her return, was that Erana was a friend of Michael’s… she had toured with INXS as a backing vocalist during the 80’s. As the day of the ceremony grew closer, Kell was feeling a little concerned about the Sydney weather. He related how he had years before scattered the ashes of his father at sea during heavy winds. The result was some what undesirable. Pastor Dennis decided they needed some “help” and so he contacted a Christian university in Ohio, USA where he had attended. Over 2,000 students, staff and friends were praying for the lead up and as the event actually happened, though there was such secrecy surrounding the ceremony, they didn’t know exactly for whom they were praying! The Pastor had also logged into the internet INXS chat room under a pseudonym to fully appreciate the extent of the grieving prior to the ceremony. The chat room closed ranks when they wrongly presumed the Pastor to be a press reporter. He tried in vain to get a “message poem for Michael”. Not realizing who he was, the regular chat roomers used a barrage of coloured language to send the Reverend on his way. The poem Kell eventually used in the ceremony, was taken by the Pastor from a “Tribute to Michael” page on the Internet. It’s strange how tragedy brings such a diversity of people together. Several weeks after the ceremony, the same INXS fans who had unknowingly “attacked” the Reverend, had now sorted out friend from foe, and enthusiastically helped him bring about a world-wide Internet hookup with Kell and INXS fans. Three months to the day after the ashes ceremony, a small representation of the fans flew in from around the world to meet with Kell. They also invited the Pastor to lead them in their own ceremony as they scattered rose petals near to the original site on Sydney Harbour on behalf of INXS fans around the world. Amongst those paying homage were “Kick” from Brisbane, “Brick” from Melbourne, “Yvette” from Tasmania and “Brat” from Canada.